Could London Overground Extend To Hertford East Station? Note that in 2019, it is proposed that two extra trains per hour (tph) are added to services between Liverpool Street and Enfield Town stations. I was also told at the weekend, a strong rumour, that in 2020, London Overground will be taking over the following services. Northern City Line services between Moorgate and Gordon Hill, Hertford North, Stevenage and Welwyn Garden City. Services to Hertford East station. The first has been mooted for some time, but is supposedly stalled because of differences between Chris Grayling and Sadiq Khan. The second was rather a surprise. So what will be the result of the Hertford East services being the responsibility of the London Overground? Greater Anglia‘s current services along the West Anglia Main Line (WAML) are as follows. Two tph between Liverpool Street and Hertford East stations. Two tph between Stratford and Bishops Stortford stations. Two tph between Liverpool Street and Cambridge/ambridge North stations. Four tph between Liverpool Street and Stansted Airport. In the past Greater Anglia have run Stansted services to and from Stratford and have said they may do so again. This means that Greater Anglia run ten tph along the WAML between Tottenham Hale and Broxbourne stations. Compare this with the measly two tph, that run between Edmonton Green and Cheshunt stations using the alternative Southbury Loop. The only other movements on this line appear to be a few empty stock movements and freight trains. But not many! Judging by some of the empty stock movements, I suspect that Greater Anglia have problems positioning their extra trains before and after the Peak. Currently, Greater Anglia run eight-car Class 317 trains to Hertford East station. These are 160 metres long and seat nearly 600 passengers in two classes. Their new Class 720 trains come in two sizes. Could it be that the five-car trains are too small and the ten-car trains are too long for the platforms on the Hertford East Branch? On the other hand, London Overground’s four-car Class 710 trains are the same length as Class 317 trains. So could it be that Greater Anglia would prefer that they didn’t have a service to Hertford East station? Crossrail will have one big effect on the planning of services on the WAML and the Lea Valley Lines, in that the new line will call at both Liverpool Street and Stratford stations, when it eventually opens. It will be a two-stop journey between the two stations, which in addition are both well-connected to the Underground. There is very little difference in connectivity between the two stations. Liverpool Street is getting to be full and given more services will be run along the Great Eastern Main Line, it could do with some capacity enhancement. Stratford though has only two platforms connected to the WAML. But there is the little-used High Meads Loop under the Eastfield Shopping Centre, which has been used in the past to turn Stansted Express trains, when they served Stratford. Loops like this can easily handle at least 12 tph, as they do in Liverpool with the Wirral Line. The High Meads Loop was well-designed to accept a lot of trains. Both tracks have a platform at Stratford capable of accepting a twelve-car Class 745 or Class 720 train. Both platforms are wide and step-free with lifts. The driver doesn’t have to change ends, when using the loop, so the loop will be efficient. An extra stop could be added at Stratford International station. It is London’s forgotten terminal station. The two train operators; London Overground and Greater Anglia would gain extra capacity in London. If travellers were able to have a choice of London terminals, I suspect that most would choose the one they liked best, but because of Crossrail, it wouldn’t matter if they ended up at the wrong terminal. I know there needs to be a bit of a sort-out on the WAML to run four tph between Stratford and Meridian Water stations, but could something more radical be on the cards. Reasonable objectives based on London Overground’s principles would see the following stopping services. Four tph between Seven Sisters and Cheshunt stations via Edmonton Green station. Four tph between Cheshunt and Hertford East stations. At the Northern end of the route, there would be three terminal platforms controlled by London Overground, one at Cheshunt and two at Hertford East. The high-performance Aventras, used by London Overground and Greater Anglia, are ready for digital signalling and designed around fast station stops. The trains should be able to stop at all stations and maintain the current timetable on the route. So the timetable could become more passenger friendly, with everything station getting four tph in both directions! The key at the Northern end could be Greater Anglia’s Broxburne station. There would be space for an extra platform and/or a turnback for trains from the South. Overground services to and from Hertford East station will call. It is planned to be the terminal of Crossrail 2. Services between Liverpool Street and Stratford stations and Bishops Stortford, Cambridge and Stansted Airport generally stop at Broxbourne. So could we see cross-platform interchanges between London Overground’s local services calling at all stations to London and Greater Anglia’s fast services? At present one difficulty, is that the Hertford East Branch can only handle three tph, which it does in the Peak, so running the required four tph might need dualling the single-track section through Ware station. These pictures show Ware station and the level crossing. The platform can accept a twelve-car train. There would be space to install a second platform. To the East the single track becomes double after the bridge at the end of the platform and is double all the way to the WAML. To the West the single track becomes double after the level crossing at the end of the platform and is double all of the way to Hertford East station. Laying a second track and adding a second platform at Ware station, is probably the ultimate solution, to provide four tph all day between London and Hertford East. But I also feel that with precision driving, the nimble Aventras will be able to do four tph, with a procedure something like this. The level crossing closes to road traffic. A Westbound train arrives in the station and an Eastbound train stops at a signal at the end of the Eastbound track from Hertford East station. When the Westbound train has unloaded and loaded the passengers, it leaves the station and takes the Westbound track to Hertford East station. When the Westbound train has safely passed the stationary Eastbound train, the points are changed and the Eastbound train moves into the station. The level crossing opens to road traffic. There would be four level crossing closures per hour, which is the same as now, but they could be slightly longer. I suspect there is a better absolutely safe operating procedure than my naive example. As eight tph will be going South from Cheshunt station; four each via Edmonton Green and Waltham Cross, Broxbourne station could turn any that couldn’t be handled at Cheshunt and Hertford East stations. So we might see the following Northern terminals, if the four tph can run to Hertford East station. Four tph at Hertford East; two via Edmonton Green and two via Waltham Cross. Two tph at Broxbourne; via Waltham Cross. All stations between London and Hertford East will get four tph. Cheshunt station needs a certain amount of rebuilding to make it step-free and possibly remove the level crossing. A step-free station is essential. The station is not a sleepy rural halt. Changes between trains from the North to London Overground services mean crossing the footbridge. It would give pedestrians, wheelchair users, buggy pushes and others an easy way across the railway, when the level crossing in closed. Southbound trains from Cheshunt could be. Northbound trains from Cheshunt could be. Four tph to Hertford East. Judicious timing of Northbound trains could mean that passengers arriving via Edmonton Green at Cheshunt could change to a Hertford East train by walking across the platform. There are a lot of possibilities to get the best connectivity at the Northern end. At the Southern End, there will be the following services. , Tottenham Hale station will receive four tph from Cheshunt. Seven Sisters station will receive four tph from Cheshunt and four tph from Enfield Town. Both stations will be able to send trains to either Stratford or Liverpool Street. Seven Sisters station is easier to sort. Half of each group of trains go in each direction. Four tph go direct to Liverpool Street stopping at all stations en route. Four tph go to Stratford via South Tottenham and Lea Bridge stations. ,Trains to Stratford should turn in the High Meads Loop under Eastfield. This map from carto.metro.free.fr shows the lines at South Tottenham station. The blue line is the Victoria Line. The orange line going down the map is the Lea Valley Line, between Liverpool Street in the South and Cheshunt and Enfield Town stations in the North. The single-track; Seven Sisters Chord, which connects the two Overground lines. The black line going down the map on the right is the WAML, between Stratford and Lea Bridge stations in the South and Tottenham Hal station in the North. 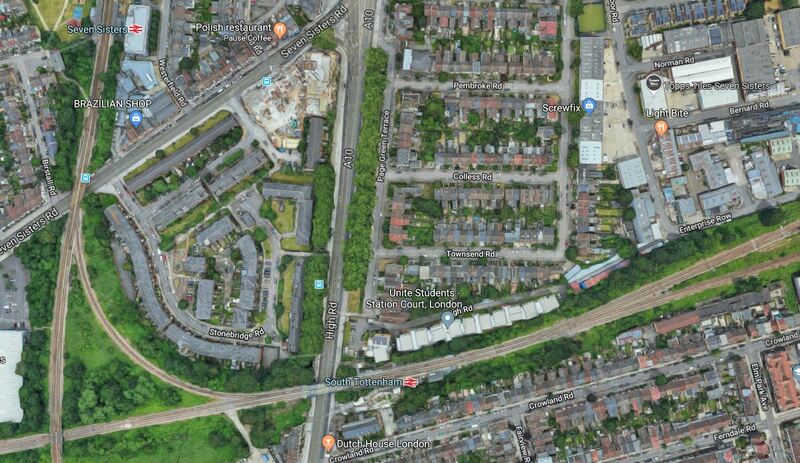 What is not shown on the map is the massive double-ended Crossrail 2 station, that will link South Tottenham and Seven Sisters stations, which are about five hundred metres apart. This Google Map shows the area of the two stations. Note how much green space there is alongside the tracks. If four tph went via South Tottenham and Lea Bridge stations, this would mean that South Tottenham station has the following services. Two tph to Broxbourne, Cheshunt or Hertford East. Timings could be arranged to give a user-friendly interchange at South Tottenham station, which is a step-free station. Note that it is probably likely, that the Seven Sisters Chord shown in the first map, would need to be improved. But there is certainly enough space to do it properly! These are trickier, but I believe they could be sorted if the new third track from Meridian Water station was used exclusively for Southbound services going to Stratford. This would mean that platform usage at Tottenham Hale station would be as follows. Existing Platform 1 – Services to Liverpool Street station. Existing Platform 2 – Services to Cheshunt, Broxbourne, Stansted Airport and Cambridge. New Platform 3 – Services to Stratford station. Platforms 1 and 3 would be a cross-platform interchange to allow passengers to change terminal. Stratford and Liverpool Street services would split somewhere North of the new Meridian Water station. Services to Liverpool Street would include. London Overground – Two tph from Cheshunt, Broxbourne or Hertford East. Greater Anglia – Four tph from Stansted Airport. This is much the same as the current timetable, with a change of operator on the Hertford East service. Services to Stratford would include. Greater Anglia – Two tph from Bishops Stortford. If all these services stopped at Meridian Water, Northumberland Park, Tottenham Hale and Lea Bridge stations, the STAR service has been implemented. These Stratford services would be turned in the High Meads Loop. As there would be four tph coming to Stratford from Seven Sisters station, this would mean that eight tph were being turned in the loop. I can see two problems with this arrangement. The merging of Northbound trains South of Tottenham Hale station could be tricky. The Cambridge and Stansted expresses use the same route to Liverpool Street as London Overground’s Chingford services, as they do now! Both problems could be lessened by perhaps running half of the Cambridge and Stansted services to Stratford. This would mean the following. Five tph that served the WAML would use Liverpool Street station. Seven tph that served the WAML would use Stratford station. Eleven tph would need to be turned in the High Meads Loop. Trains on the High Mead Loop would be as follows. It could be that the expresses could use one track of the High Meads Loop, with the local services using the other. I also think, that there is sufficient capacity in the High Meads Loop to terminate all services on the WAML at Stratford. But would that be a step too far? Possibly for some passengers, but I suspect it would be liked by train operators. Currently, the following services run between Tottenham Hale and Broxbourne stations on the WAML. Two tph between Liverpool Street and Cambridge/Cambridge North stations. This gives a total of ten tph in both directions. If you go to my first scenario of providing four tph to Cheshunt/Broxbourne/Hertford East, this gives the following services between Tottenham Hale and Broxbourne stations. Two tph between Stratford and Broxbourne stations. The extra service between Stratford and Broxbourne is to ensure that all stations on the route get four stopping services, of which two tph go to either Liverpool Street or Stratford at the Southern end. This gives a total of twelve tph in both directions. By adding just two tph, there is a vastly improved stopping service along the WAML, with all stations getting at least a four tph service. Could The West Anglia Main Line Handle Twelve Tph? In 2020, Greater Anglia will be running Class 745 and Class 720 trains on this route. They will both be 100 mph trains. They will have fast station dwell times. They may even have level access between platform and train, which will help speed boarding. They will have a quality Driver Assist System. Electronic in-cab digital signalling is a possibility. The WAML may allow some 100 mph running. Removing the remaining level crossings would surely speed up services. The Greater Anglia trains will be limited stop and most will only stop at Tottenham Hale, Cheshunt and Broxborne. London Overground will also be running Class 710 trains, which will be faster than current trains, with very good dwell times. So I expect that with new trains, some improvement to the infrastructure, the following will be possible. Four tph, which stop at all stations between Tottenham Hale and Broxbourne. Six tph, which are limited stop expresses, only stopping at Tottenham Hale and Broxbourne and a couple of other occasional stations. Time saving for all services. I suspect that the current Stratford to Bishops Stortford service will become limited stop North of Meridian Water station. It would hopefully be a timetable, that appealed to both passengers and train companies. Meridian Water station has been promised four tph to Stratford, that call at Northumberland Park, Tottenham Hale and Lea Bridge stations. So what services will call at Meridian Water station, in the scenario I have outlined, that follows from four tph between London and Hertford East being transferred from Greater Anglia to London Overground. It could be something like this. Two tph to Hertford East, calling at all stations. Two tph to Bishops Stortford, calling at selected stations. Two tph to Cheshunt or Broxbourne, calling at all stations. Four tph to Stratford, calling at all stations. Two tph to Liverpool Street, calling at all stations. It’s certainly better and more comprehensive than promised. As Meridian Water will be such an important station, could some of the Cambridge and Stansted services call? This project is needed to both increase capacity to Cambridge and Stansted Airport and in the future for Crossrail 2, which will reach as far as Broxbourne station. But it will be a very disruptive project, not just for rail users, but for road users, when they close several level crossings. The limited triple-tracking around Tottenham Hale station has been moderately disruptive at weekends and services have run using the Southbury Loop. The Southbury Loop is underused and I believe that if services were increased permanently on the diversion route, that it would have the beneficial effects on the WAML. Extra services could be added to the existing double-track route. There is one section that could be easier than most to four-track and that is the section between Cheshunt and Broxbourne stations. This Google Map shows the line North of Cheshunt station. I have flown my helicopter along this route and just as in the map, the two-tracks sit on a wide site, with space for extra tracks. I am fairly certain,that four-tracking this section would not be difficult. If the Southbury Loop were to be used to handle some trains, I think the four-tracking could be done in a more relaxed series of small projects over a longer period of time. Enfield Lock station and level crossing. Brimsdown station and level crossing. There are no buildings in the way. There will already be a third-track between Tottenham Hale and Meridian Water stations. Northumberland Park and Meridian Water stations will be fourth-track ready. I very much feel, that the four-tracking can be done piecemeal without too much disruption to rail pr road traffic. Over the years, other issues have been raised with the WAML and Crossrail 2. I’ve read in a couple of places, that there could be a bay platform at Enfield Lock station, which could turnback trains to the South.. Under the current plans for the STAR service, this will terminate at Meridian Water station and I’ve heard station staff, say it will be a bi-directional shuttle between Tottenham Hale and Meridian Water stations. Not be using the new infrastructure in a worthwhile manner. Bring more passengers to the overloaded Victoria Line. Not take passengers to the transport hub at Stratford with Crossrail. Not be an efficient use of a train and crew. I also think, it would struggle for passengers until the building of housing at Meidian Water gets under way. But supposing, two tracks were built North from Meridian Water to Enfield Lock station, where there would be a bay platform. A fourth track would need to be added alongside the third-track between Lea Bridge and Meridian Water stations. Another platform would be needed at Tottenham Hale station. There is a lot of space on the Eastern side of the WAML, between Meridian Water and Ponders End station. Two extra tracks through Brimsdown station, should be possible with the purhase of some low-grade commercial property. Note that currently a train from Enfield Lock to Stratford takes twenty-four minutes, if it stops at the little-used Angel Road station. If a train turned in the High Meads Loop at Stratford, it could be back at Enfield Lock within the hour. Four tph would be possible. This would provide a much needed service for all those who do and will live, work and enjoy themselves allow the Lea Valley. Four trains would be needed for a four tph service. 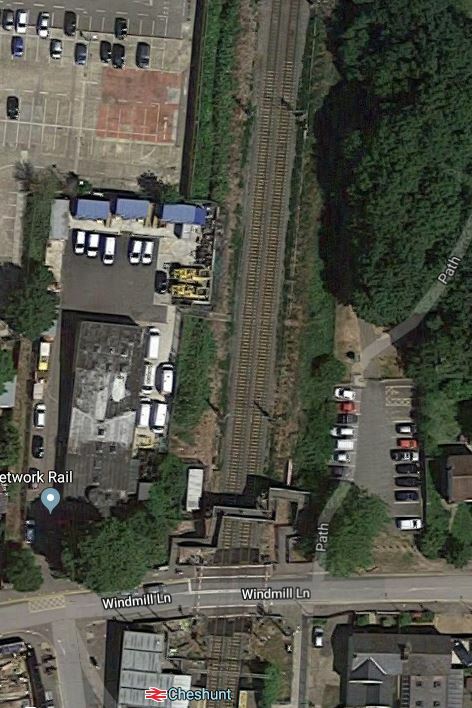 I can understand, why Enfield Lock station has been talked about as a place for a possible bay platform. There would also be the possibility of extending to Enfield Lock, without closing the level crossing at the station, if a step-free bridge were to be provided. The station could become a valuable interchange between Greater Anglia’s Bishop’s Stortford services and the four tph to Stratford, stopping at all stations. Eventually, though, the level crossing will be removed and four tracks will be extended Northwards. If as I proposed the following trains run through Seven Sisters station. Two tph between Liverpool Street and Cheshunt/Broxbourne or Hertford East. Two tph between Stratford and Cheshunt/Broxbourne or Hertford East. Two tph between Liverpool Street and Enfield Town. Two tph between Stratford and Enfield Town. This means that Hackney Downs would have the following services. Four tph between Liverpool Street and Chingford. Would it not be more efficient, if all of these services used the slow tracks into Liverpool Street? This would give the expresses exclusive use of the fast lines into Liverpool Street. This post has been speculation on a rumour. But I now believe that Hertford East services will transfer to the London Overground. London Overground have trains suitable for the service and Greater Anglia don’t! Greater Anglia services may be simpler to operate. Ware station needs to be rebuilt to enable a decent service and Funding the work might be easier for London Overground in partnership with Hertfordshire County Council, than for Greater Anglia. Large numbers of stations in the London Borough of Enfield get a four tph service. By using the Southbury Loop, extra services can be run, without adding to traffic on the West Anglia Main Line. In a few years time operation of the West Anglia Main Line will be very different. From the way that it was told to me, by a long-standing Overground employee, it sounded correct. As to the Watford Junction extension, I think new technology has overtaken the project and I wouldn’t be surprised to see Chiltern have a hand in the solution.